John White RBA RI (1851-1933). Landscape, marine, portrait & rustic genre painter. White was educated in Australia and studied at the Royal Scottish Academy. 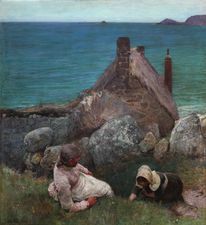 He moved to Devon c.1890. He exhibited at Royal Scottish Academy, Royal Society of Painters in Oil (106 wks), Royal Institute of Watercolour Painters (190), Royal Academy, Royal Society of British Artists and extensively elsewhere.